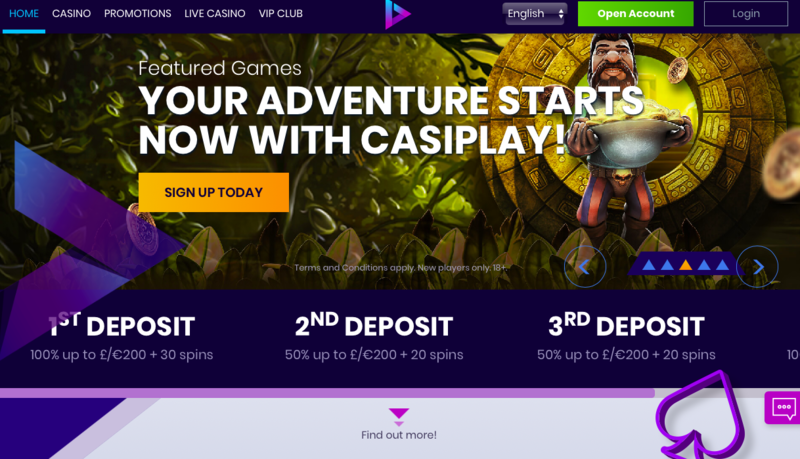 There seems to be no let up in the amount of new online casinos launching and Casiplay is another new contender. Some new online casinos have taken the industry by storm where as others have been somewhat of a washout. It’s an ever increasingly difficult market to crack and new sites really have to stand out from the crowd and gain the trust of players to last the test of time. Let’s take a look and see what Casiplay has to offer. First impressions when you hit the homepage are actually really good. Immediately, you’re greeted with sleek graphics from slot games and reels running in the background, along with information about the welcome bonus, featured games and exclusive promotions. The colour scheme is predominantly dark purple with light blue highlights and a simple but memorable logo in the middle. The logo is quite clever actually. It’s a simple triangle on its side, the same as a ‘play’ symbol on a stereo and it reminds you of those old Maxwell Cassette tapes which totally fits with the name and brand identity as a whole. 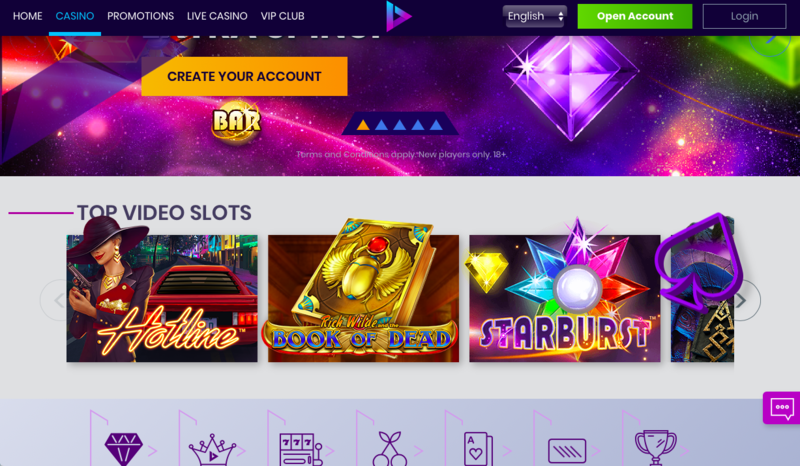 Along the top of the page are links to the main casino, promotions, live casino and the VIP club and you can also select what language you’d like to play in. The options are English, Swedish, Norwegian and Dutch and there’s also the live chat option available too. Scroll further down and there are more previews of the games available, offers and promotions, all with eye-catching graphics. The only criticism of the design is that the side bar enabling you to scroll down, is really small and thin and it can be really difficult to use. It’s difficult to select and you can end up clicking somewhere you didn’t mean to or just struggling to actually grab the bar at all. Head to the casino section and you’ll find a great selection of new releases, video slots, classic games, table and card games and scratch cards. You’ll find popular titles such as Starburst, Gonzo’s Quest and Thunderstruck, to name just a few. The layout here is really clear and user friendly. Despite there being a lot of content, you don’t feel overwhelmed and it isn’t cluttered at all. Powering Casiplay is an impressive list of software developers. We have the ever-popular NetEnt, Microgaming, NYX Gaming, Quickspin and Play’n Go to name a few and as a result, we know the game quality will be spot on. There is a huge selection when it comes to the live casino games. There are plenty of game options for Blackjack and Roulette, as well as Baccarat and brand new Dream Catcher. Casiplay has licenses from the UK Gambling Commission, Malta Gaming Authority and Alderney Gambling Control Commission, so players have reassurance the site is trustworthy and adheres to all the relevant guidelines. You can play at Casiplay on mobile devices so it’s great for those who want to play on the move and crediting your account is straightforward too. Visa, Neteller, Mastercard, Entropay and Skrill are all accepted. However, like with many online casinos, you may need to provide proof of identity and further documentation when making a withdrawal. Casiplay doesn’t have an especially niche theme to make it really stand out from the crowd, but that being said, some really original sites don’t always attract or retain their players, so a unique theme isn’t always necessary. Casiplay is however, different enough to be memorable. Its coherent design and theme is really impressive; link that with well set out game options, easy to navigate pages and superb game selection, and you have a really solid new online casino that will attract both new and experienced players alike. It’s definitely worth a visit.